Digital transcription kits by various manufacturers. 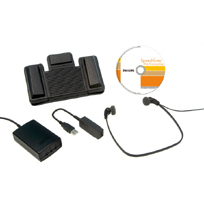 Each software package comes complete with transcription software, foot pedal and headset. With its new ergonomically improved four-pedal foot control, latest-generation Olympus Dictation Management System (ODMS) software, and improved Olympus E-62 headset, the AS-7000 improve transcription results all across the board. The AS-2400 transcription package is compatible with DS, WS, VN-3200PC and VN-5200PC recorders from Olympus to provide a complete transcription solution. Comes complete with footswitch, headset, and powerful software. Complete with a set of ergonomic accessories, including a foot pedal and headset; the software allows for transcription of several different file formats, including dss and ds2. iChannel Express is a stand-alone software transcription solution by Digital Accessories Company. Dictation can be stored on a network share or your own computer.Express integrates easily with all virtually all digital dictation products including VS Recorder and Philips or Olympus portables.